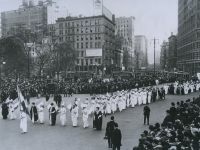 Women’s march for suffrage in 1912. The choice to be peaceful can be seen as one of arrogance. In my case, it is born of arrogance, but perhaps well-earned—sometime following my hundredth assault, it occurred to me that none of the many, many people who have ever tried to hurt me really succeeded. Bruises and a wary attitude are the only relics. I don’t even have any good scars to show you. Peacefulness can be this statement: you cannot hurt me. You might wound my body. It is probable you can frighten me. You might even traumatize me. But you cannot hurt me, not really. The only thing that could hurt me would be if I aggressed towards you. The scars of my actions would follow forever. To the peaceful person, this is the definition of harm. We might likely to prefer to die or be maimed by your aggressions than live with our own. The peaceful person has in some ways removed him- or herself from the reach of aggression. We can be saddened by it but never really hurt. This in some ways removes us from the world in an important way, a kind of disengagement and denial of death. Death becomes immaterial. It matters less, or to the devout, not at all. Sometimes in my arrogance, I consider a sort of limited passivism. If my aggression harms me, and I am certain your aggression harms you, and I know I could overmaster you if it were my desire to do so (my job for 15 years was to overmaster people who had lost control of their aggressions), then would I not serve the aggressor better by not allowing them to harm others? If attacked, could I refuse to be hurt but also refuse to hurt? The older and weaker I grow the less this is a realistic option, and yet it bears examination. Could I sacrifice my own peacefulness to help you not do harm? Adrian Van Kaam might show us the answer to this dilemma. The aggressor still intends aggression. Preventing that aggression by force only prevents the results of the aggression, not the aggression itself. Violence is still done. In psychotherapy, Van Kaam urges us to be mindful of the effects of our power and authority on the client. Trying to make the client change robs them of agency. Perhaps clients become the perfect people we have in mind when we “cure” their “mental illnesses,” but they become those people absent of their own volition, their own growth. Something vital has been lost. Better if I stay peaceful. Only when the aggressor sees the results of his aggression does he have a chance to change, to decide to leave aggression behind. Bound, imprisoned, prevented from harm, overmastered, the aggressive person lives in an enforced peace and is there divorced from reality, unable to choose freely. You are not free to do that which you must do. You must stand and walk upon the Earth and are therefore not free to do so; you are limited by a lack of other options. So arrogance must have some limit if peacefulness is to be genuine. The peaceful one tolerates the harms of others in order to limit aggression, not only against the physical persons around them, but also against the agency of those persons. By limiting our agency to our own person, refusing to make this crucial decision for others, do we truly disengage from the larger world? To be human, we need engagement. While not resisting aggression in the moment it occurs, at least not with violence in kind, it is important to advocate for and enact change at the social scale. Help people come to peace by establishing the conditions in which peace can ripen. Work for social justice. Keep people from the need to live at the low end of Maslow’s hierarchy. Sometimes this means marching, holding a sign, standing between warring factions, interrupting a shooting, standing in front of a tank. As I have never been tested, this is so far just another arrogant rant, empty words. Take them as such. I hope to continue to live an untested life as long as I am able, and I wish you the same. But when you are tested, I hope you are able to make a choice that satisfies you.